Compact and energy-efficient, AEG tumble dryers use cutting-edge tech to safely dry even delicate fabrics. Designed to dry big loads and small loads with outstanding efficiency, AEG innovations help protect your clothes, allowing you to dry fabrics like wool and silk with confidence. With the AEG tumble dryer range, you’ll find a selection of clever dryers to suit your home. Whether it’s for use in the winter while the weather’s bad, quick-drying for work the next day, or taking care of the whole family’s laundry more easily, AEG has combined consumer insight and science to deliver better cleaning for everyone. 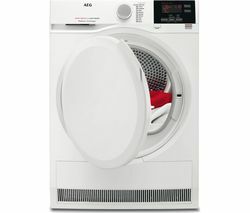 8000 Series AEG tumble dryers have the greatest capacity in the range and hold up to 9kg with ease. These Woolmark-accredited dryers ensure even delicate woollen items come out tumble-dry soft without shrinkage. AEG uses the unique AbsoluteCare® System, which controls the precise temperature and movement of the drying drum. It means that all of your ‘hand wash only' items lie flat against the drum during rotations to replicate flat drying. No garment shrinkage, and no loss of shape either. The 8000 Series also includes an outdoor programme, especially for your outdoor wear, gym clothes and hi-tech fabrics. It also restores the water protection of the waterproof membrane of outdoor fabrics better than air drying. 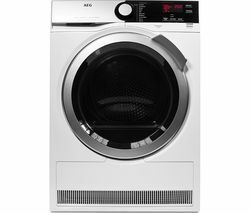 AEG 7000 Series uses energy-efficient SensiDry® technology to get clothes dry at almost half the temperature of conventional dryers. It means your garments retain their shape, colour and texture for longer and cuts down on energy usage too. And to protect your clothes further, the AEG 6000 range features a ProTex soft drum with a special pattern that improves airflow to your clothes, reducing tangles and creases. For more help with the laundry, take a look at our full range of laundry appliances, including our Hotpoint tumble dryers, and washer dryers that save you space in the home.